Burris Droptine 3-9X40 Review - How Is It Different To The Fullfield II? The Burris Droptine 3-9X40 rifle scope is the most affordable in our Burris line-up, and one of the newest. Even though it has a budget-friendly price tag, it has exactly what you need to fill your tag this hunting season. A solid rating online keeps consumers like you rolling in and buying up. Admittedly, the Droptine rifle scope nearly lost its place in our review list. When comparing it to the older, but very popular Fullfield II scope, I thought the Fullfield was the clear winner. But… the slight differences between the two ended up making it worthwhile to review both of them. As a high performing, low budget scope this Droptine has excellent value for the hunter who wants to save a few bucks but wants to go home big on quality. For the shooter and hunter who wants the lowest price possible with the highest performance power, this Q&A is for you. Is there another reticle available with the Droptine scope? This Burris rifle scope has the Ballistic Plex reticle which is a simple, easy to use, and uncluttered designed reticle. It’s the duplex style with three stadia lines on the elevation cross hair below the center point for trajectory holdovers for known distances. The neat thing about the Droptine is it also has another reticle available that’s been specifically calibrated for .22 LR ammunition – the Ballistic Plex 22LR reticle. When the rifle scope uses the regular Ballistic Plex reticle, the parallax is set for 100 yards for typical centerfire bullets. You can calibrate your rifle scope with any cartridge and bullet weight for any bullet for the ballistic reticle. When using rimfire 22LR bullets with the Ballistic Plex 22LR reticle the parallax is set for 50 yards. So, if you’re mostly going to be using the scope on a .22 rifle while you’re keeping the hordes of rabbits, rodents, and other varmints away, the specially calibrated reticle was made for you. You check out the scope that comes with that reticle here. Is this model the exact same scope as the Fullfield II? While they are exactly the same in physical dimensions, optical quality, and durable and rugged construction, there are some differences that you might find benefit the one or the other. The first is the two rifle scopes have different style turrets. The Droptine is a closer cousin to the newer Fullfield E1 rifle scope with the heavy knurling design, which is very popular among hunters. In fact, we hunters all prefer the heavily knurled turrets and power pieces for better gripping and easier rotations. The Fullfield II has a more subtle and sleek knurling design that really can’t be compared to the Droptine. Another difference is in the eyepiece and power ring. The Droptine features these two parts of the scope as separate pieces. Many users prefer this feature because the focus isn’t being accidentally messed with when putting on and taking off caps. Other than that, the Droptine is marginally cheaper than the Fullfield II. Does Burris have a ballistics software program? The Burris Droptine rifle scope with the Ballistics Plex or the Ballistics Plex 22LR reticle is compatible with the Burris Ballistics software program online. This is worth mentioning since it’s a new software program that Burris has recently released, and there seems to be a lot of confusion still as to how to properly use the ballistic reticles. It’s super easy to use – just enter in the scope you want, the ammunition info, and the relevant sea level/elevation and atmospheric numbers and you’ll be given your distances for each mark on the reticle. What type of hunting can the Droptine scope be used for? This 3-9X40 mm rifle scope has excellent specs as a basic and entry level scope for big game hunting, predator hunting, and varmint and small game hunting. For the shooter who wants an all-purpose scope for while you’re in the forest or out in the fields where bullet trajectory matters, the Droptine with the ballistic plex reticle is a great scope to get it done. If you’re using the Droptine with the ballistic plex 22LR reticle, please just stick to varmint hunting or plinking on a Summer afternoon. According to the bull’s-eye, the Burris Droptine 3-9X40 scope may have more than entry-level potential. Its quality might be entry-level, but used in the right hands with the right know-how, it can have a lot more to offer. If you can afford to spend a little bit more, swing by the Burris Fullfield II. The integrative focus system might intrigue you, or it might just annoy you. Either way, it’s worth checking out. 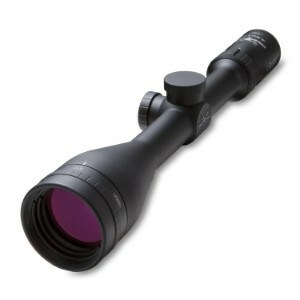 An alternate equivalent could very well be the Bushnell Trophy XLT Bone Collector Edition 3-9X40 scope. It’s also cheaper than the Droptine, a whole heck of lot more hunters have given their two cents on it. It’s also around 100 bucks, which is why it’s so popular. Check it out to see what the Bone Collector rifle scope is made of. Burris does entry-level, mid-range, and premium optics well. The best part about it is, you don’t have to pay premium prices. Where you can get premium quality for low-budget prices, you should take it in a heartbeat!